It’s the birth date of Valerie Worth (1933–1994) All the Small Poems and Fourteen More. In 1945 the first ballpoint pens goes on sale for $12.50 each! Read The Bronze Pen by Zilpha Keatley Snyder, Ellie McDoodle: Have Pen, Will Travel by Ruth McNally Barshaw and A Pen Pal for Max by Gloria Rand, illustrated by Ted Rand. On this day in 1969, the U.S. Supreme Court rules segregation must end. Read The Story of Ruby Bridges by Robert Coles, illustrated by George Ford, Rosa Parks: My Story by Rosa Parks with Jim Haskins, and Satchel Paige: Striking Out Jim Crow by James Sturm and Rich Tommaso. It’s Hermit Day so spend some time alone, thinking, writing or reading. Try Kermit The Hermit by Bill Peet. Around this time of year, I like to alert Almanac readers to some new titles, ideal for holiday gift-giving, that they might have missed. 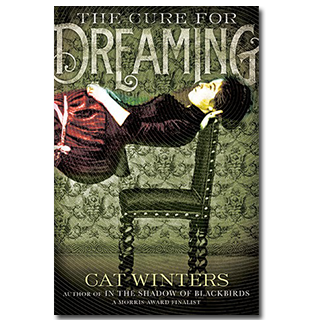 Today I want to sing the praises of the second novel by Cat Winters, The Cure for Dreaming. Now, I have been an active part of the children’s book world since 1970. And then, as now, nothing makes me more excited than when I find a new creative voice, someone who combines original material with a compelling writing style. Hence I was thrilled to read this book by Cat Winters, one of the Morris Awards nominees for new talent for In the Shadow of Blackbirds. In her second novel, she has brought together seemingly disparate elements–hypnotism and the Women’s Suffragette Movement–in a page-turning, exciting work of historical fiction for readers ages eleven through fourteen. The protagonist, Olivia Mead, is one of the most appealing I have encountered in recent fiction. A young girl living in Portland, Oregon, in 1900, Olivia has taken up the cause of women’s suffrage; the Western part of the United States, in fact, gave women the vote long before 1920. But Olivia’s passion for women’s rights conflicts with her father’s stern and unbending sense of a woman’s place in the household. And he has become even more rigid after Olivia’s mother flees to New York to pursue her dream of acting. The story begins in a theater, when a traveling hypnotist, Henri Reverie, selects Olivia as his subject for experimentation. She proves particularly susceptible to his craft, remembering little of the events that occurred while she was under his spell. Eventually Olivia’s father comes up with a demonic plan: he wants Henri to hypnotize Olivia to make her repulsed by the ideas of the suffragettes. Because Henri needs money for his sister’s operation, he complies, although not quite in the manner that Olivia’s father envisions. For although Olivia becomes unable to speak her mind, she can see the true nature of those around her. Weaving multiple plot strands together and creating a vivid sense of the time when women fought to express their views, Cat Winters tells a compelling, truly mesmerizing story. And with a finale that will leave readers, no doubt, hoping for more books about Olivia, these threads have been expertly brought to a satisfying conclusion. Bravo, Cat Winters! A fabulous performance! I can’t wait to see what you will do next. The hypnotist wrapped his fingers around mine and helped me climb to the floorboards above. Our respective pair of gloves separated our hands, but I felt the warmth of his skin beneath the smooth fabric. Hot white lights smoked by my feet and glared down at us from the ceiling like an army of small suns. I shielded my eyes while Henri led me to the center of the stage, continuing to hold my hand. Originally posted October 29, 2014. Updated for . This sounds really good–I feel like Olivia and Muriel (from Crossing Stones) would be friends!